A fire at Brazil’s research station on King George Island has killed one soldier, and two more are missing. 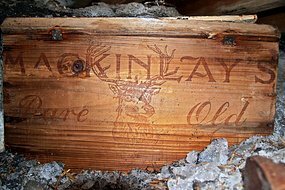 A crack team of New Zealanders have rescued three bottles of Whyte and Mackay whisky from a hut built by Ernest Shackleton in 1908. The whisky itself would have been distilled around 1896. During the course of the touch-and-go whisky rescue mission, the erstwhile Kiwis had a contingency plan in the event that they were unable to sucessfully remove any of the bottles: an industrial syringe, which would be used to draw out the precious, precious booze. After an extended thawing session, the bottles were personally collected and flown back to Scotland by Vijay Mallya, owner of Whyte and Mackay. This type of whisky was thought to be extinct. The team of The wooden crate containing the whisky, marked British Antarctic Expedition 1907, was frozen solid in the minus 30 degrees Celsius temperatures but the whisky in the bottles was still liquid. … now that’s a booze run. Australian Broadcasting Corporation, via Dr. Leigh Smith.